Time to look at browser share again. It's been almost a year and a half since I examined this previously. Click on the charts to make them bigger and see the raw data. I got this data from Site Meter. Here are the statistics for Ben's Blog, Where I've Ben, and BenMoore.info. Please weigh in on my assumptions and interpretations. The page views on BenMoore.info are so low (less than 1 per day) that I'd discard it statistically . 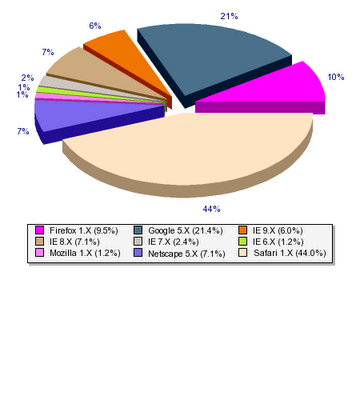 I show it only that Internet Explorer shows up overwhelmingly here. 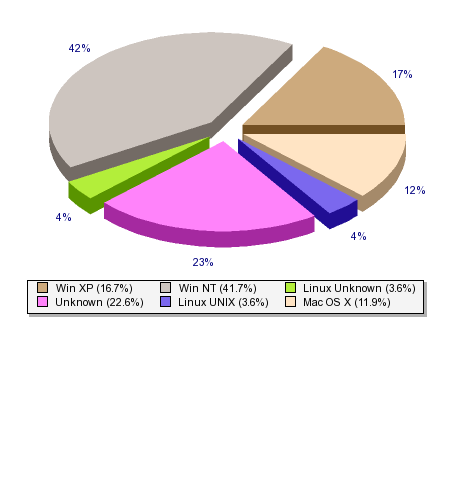 My reading of that is that BenMoore.info gets hit by more enterprise users than the other two. 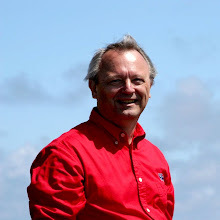 Back to Ben's Blog and Where I've Ben. I think that the browser war is over. And the winner is not Internet Explorer. Not Firefox. Not Chrome. But Safari! 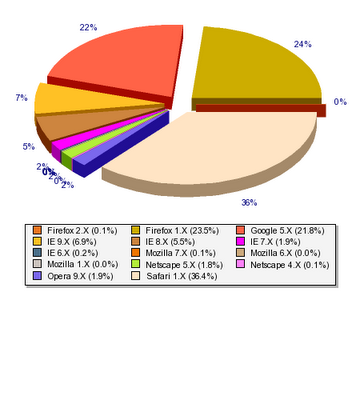 Safari has a dominant share on both blogs. Then the question came to mind, are these Mac users or iOS users? 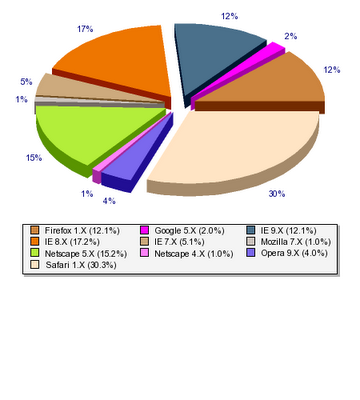 That's hard to tell from this chart but let's look at page views by operating system. Again, click on the charts to make them bigger and see the raw data. Let's just concentrate on Ben's Blog and use the raw numbers. Safari was 36.4% of the page views. Unfortunately iOS is not separated out in the Operating System numbers. And to confuse things, Android's browser calls itself "Safari." I know the Operating System says "Macintosh MacOSX" but I believe iOS is lumped into "Unknown." Here's what a "real" Macintosh looks like. Notice the screen size. That really puts a kink in the numbers. But assuming that the usage of "Safari" is all on either Mac OS X, iOS, or Android we can back into it. 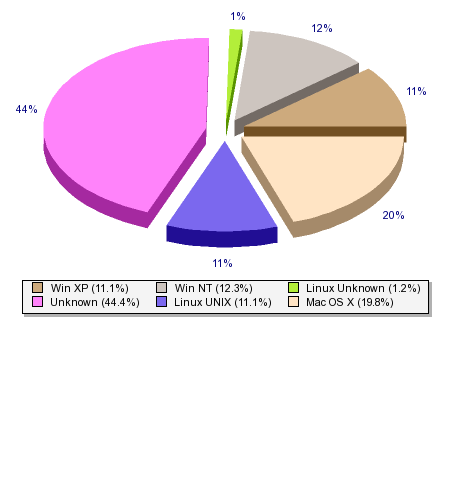 Mac OS X was 12.8% of the page views. 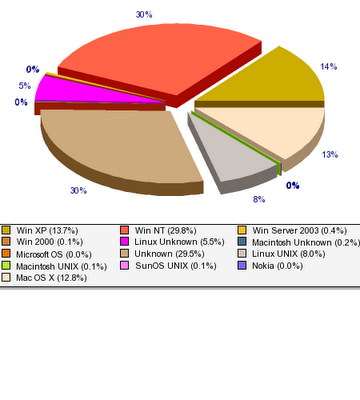 Linux UNIX was 8.0%. 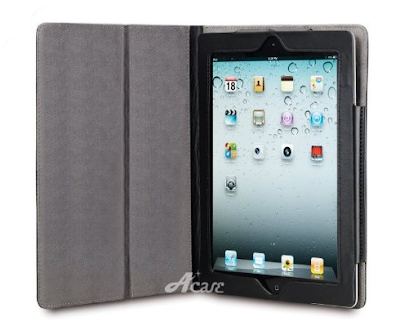 This leaves 23.6% of the page views from mobile devices with iOS leading with 15.6%. Mobile beats Firefox at 23.5% and we know that Firefox is floundering. Almost 3 years ago I posted about how I used Google Voice. Lots has changed since then so it's time for an update. Since then I've continued to use Google Voice and become more dependent on it. So much that my wife got frustrated with the incoming calls at our house that started off with Google Voice's call screening. To mitigate this I am using a RingMaster number as part of my AT&T Complete Choice Enhanced service. This RingMaster number has distinctive ring so she can tell that the incoming call is for me. As Complete Choice has multiple RingMaster numbers I have a second Google Voice number for my wife that has its own distinctive ring. One of the issues I noted in my original post regarding cellular mobile to mobile was covered here as not being an issue but I'll repeat that here for completeness. Don't worry about it for incoming calls. Google Voice is now incorporated in Google Hosted Apps so contacts are shared between Google Voice and your Google Hosted Apps e-mail. And obviously these contacts are presented on your Android phone so the contacts and their management is now seamless. Nice. In my original post I called "voice mail transcription (cute but really pretty worthless)." I stand by that. I'm disappointed that Google hasn't made any progress in that area. The only thing remotely useful in the transcriptions is telephone numbers. Previously I mentioned "service disruptions." These are almost non-existent now. Rarely I have a call where the sound is choppy and that is always with one of the parties being on a mobile phone. The Google Voice exchanges are sometimes new to the local phone network and I've had occasional issues with private telephone switches not recognizing the Google Voice exchange. This is always on SMB phone systems so I think it is a local administrator issue. One of the most useful features is the Google Voice logs. The "History" log is a comprehensive history of all calls, incoming and outgoing, and text traffic. In addition to the expected information, e.g. number, date, time, status, etc., there is a "note" field. 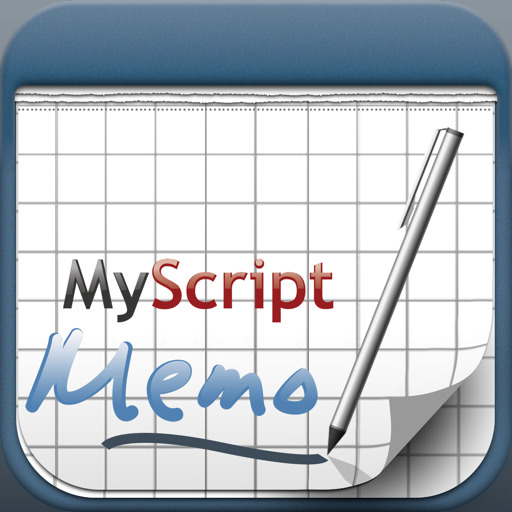 I use this to annotate the calls including the name of the caller if not in my Contacts. As expected there is a powerful search capability. International calling rates are still the most attractive I've found. Basically calling a landline in Western Europe is 2¢ per minute. I am not a big international caller so I'm actually still running off the startup $1.00 credit Google gave me. Google Voice still doesn't support MMS text messages, i.e. SMS with media. There is a workaround for Sprint customers described here but I'd still call that a hack. Google Voice doesn't support fax. Although this is getting less and less pertinent it's still an issue when dealing with many businesses. This is gonna take some noodling. I've been using AIM for forever. I even played with MSN Messenger. Both of these clients got so heavily ad-based that they turned me off. And I had to have 2 clients installed and 2 different buddy lists. But it's still client-based so I have to install it everywhere (yes there's a portable variation) and the logs are local to the application instance. Closer. And meebo even supports iPhone, Android, BlackBerry and Symbian. But... MSN won't allow but a single logon per identity. This means that if I'm logged on to MSN at one computer using meebo and go to a second computer and logon to MSN using meebo, MSN force logs me off of the first computer. Then if I log off the second computer, I'm not logged on to MSN anywhere. I kept searching. And imo supports iPhone, iPad, Android, BlackBerry, and Symbian. Here's the twist. imo establishes the sessions with their server, not your computer. Let that soak in. Now your MSN session is with imo's server and you can have multiple concurrent sessions. 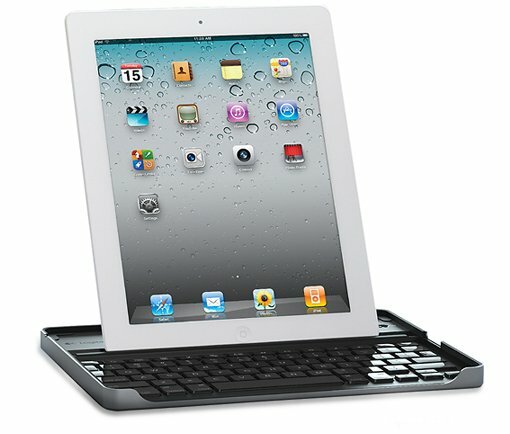 You can even go from one computer to another computer and pick up the conversation in progress. Really nice. imo optionally will maintain centralized logs and even encrypt them. And you can link your identities. What this means is that when you login to imo with one of your identities all of the linked identities will be logged in as well. Easily the best I've found so far. This is a courtesy notice to let you know that your eBay password has been changed. No response is needed! I think a response IS NEEDED! Notice the little gold key at the top left. This is Gmail verifying that the e-mail did actually come from eBay. That's about the last good thing in the e-mail. The e-mail is html so the link for you to go to "if you did not make this change" isn't simple text so the underlying link could be anything. Thankfully it is consistent but why make me worry? Next there is no way to navigate to the eBay location without using that link. In other words, you can't just type ebay.com in the URL field and navigate independently of the e-mail. That is Rule One of links in e-mails: Ignore them and type them yourself. Remember the IP address in the e-mail. We'll look at that in a minute. The identity of this website has not been identified. Your connection to ocs.ebay.com is not encrypted. You have never visited this site before today. None of that made me feel very good. Much more comfortable. That's what I'd like to see when I think my password has been hacked. I followed the links and called eBay. I was on hold less than a minute. The agent e-mailed me a link to reset my password. That was a plain text e-mail. Much better. I did that and all was fine. html again. Interesting how different that is than the fraudulent one. Why? Now let's step back some. 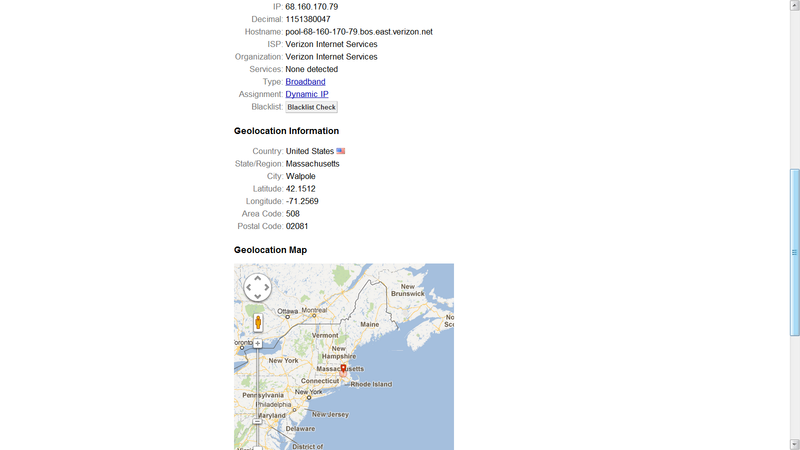 That first e-mail had the IP address that changed my password: 68.160.170.79 WhatIsMyIPAddress.com does a good lookup on it. 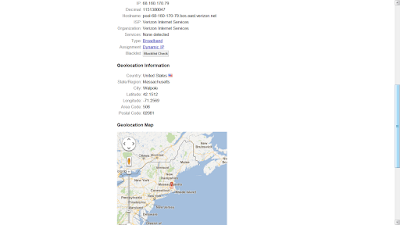 It was from a Verizon broadband customer in the Boston area. Nope, I haven't been to Boston lately. Interestingly when I did get logged in to eBay, I could tell that the hacker had actually used my account. Yeah, I know how to spell "Ford Explorer" and I'm not looking for a '79 Trans Am parts car. I did have a '79 Trans Am once and parts are all it's good for. Well, that was an exciting afternoon but seems that all is well. I've blogged about DSL before and about bandwidth before but never about DSL bandwidth so here goes. There are always rumblings about bandwidth caps among the carriers, both landline and wireless. While I'm not a huge user of bandwidth that got me interested in what I was using. Fortunately I'm using dd-wrt in my home router. 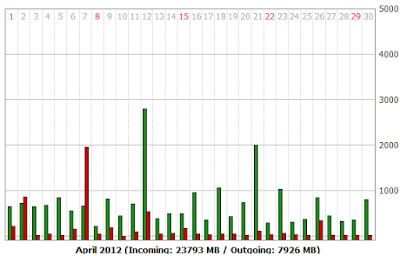 One of the administration screens shows you the WAN bandwidth over time. Here's what one month's looks like. I've been capturing this month by month and graphing this. 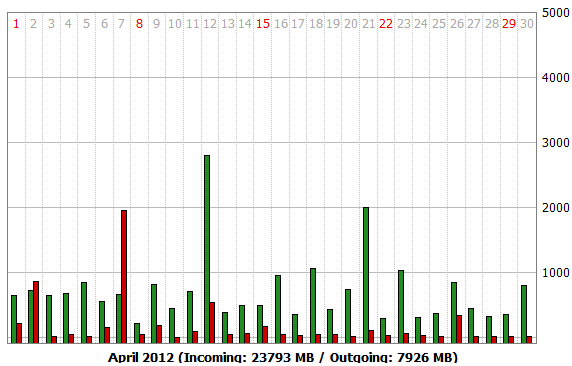 So I'm just below 3 Gb down per month. That spike back in the summer of 2011 is the month before my TechNet subscription lapsed. I'm not sure that this is actionable right now but is interesting nevertheless.